Just a quick update as I’ve simply not had time to take pictures, nor get the permissions I’ve asked for. In a nutshell, once again, we *may* have adverted a crisis. I’ve been consulting a fish vet for the past few days, and for lack of a better way of explaining it, there are lots of things a vet would want to do to a fish in this condition that aren’t practical. Not practical in so much as the vet I’ve been talking with is 3 hours away, and can’t be here on site to see the fish even if I could afford to compensate the vet for the trip and time combined. The other practical issue is one of risk and probabilities; netting a fish with an infected eye is never a good idea, and as I learned, a swab of the eye would likely yield no pathogens anyways as the causative agent is probably largely internal. Plus, if there is an ongoing infection of the eye itself, I could easily see a swab somehow popping the eye and well, making matters worse. In the end, it is my opinion that while consulting with a vet made for a very good sounding board and gave me some new things to consider, without the direct interaction, there was little if anything different the vet would’ve had me do. Plus, considering I was seeing some improvements as we were consulting, it’s difficult for any doctor to suggest a change if what’s being done outwardly appears to be working. I get that, 100%. And on the topic of prevention – minimize stress, maximize good water quality. No surprise, I’ve been doing that for years. So I think none of us have even a guess as to why this is happening, which means that every hypothesis we’ve put forth could be valid. So yesterday (Tuesday) was the last dose in the 5 day course of Maracyn and Maracyn II, which I ran only weeks prior for the mouth rot. I’ve been feeding the Dr. G’s food daily; I’ve made this judgement call to feed at twice the package’s recommendation based on several things, but perhaps most importantly that the Lightning Maroon isn’t an aggressive feeder (never really has been) and thus, it’s difficult to get this fish to eat as much as you might think it should within a 1-minute time window (as prescribed by the food’s directions). Still, it’s important to note that this food introduces both Metronidozole and Kanamycin to the mix, and it is again reef safe as far as I can tell. The downside here is that the Lightning Maroon’s interest in food was diminished today, so getting a fish to eat the medicated food is obviously a problem. The pair however, has been cleaning like crazy…for all I know the pair could wind up spawning (my female Percula often has a diminished appetite in the day or tow prior to a spawn). The actual eye – much improved and it would seem that there isn’t any vision loss. There is still some tissue bulging out around the eye however, which made me reluctant to stop the treatment with Erythromycin and Monocycline (active ingredients of Maracyn and Maracyn II). I’m trusting the vet on this one. Here’s the real worry, and sadly this does make some sense. Mycobacteriosus. 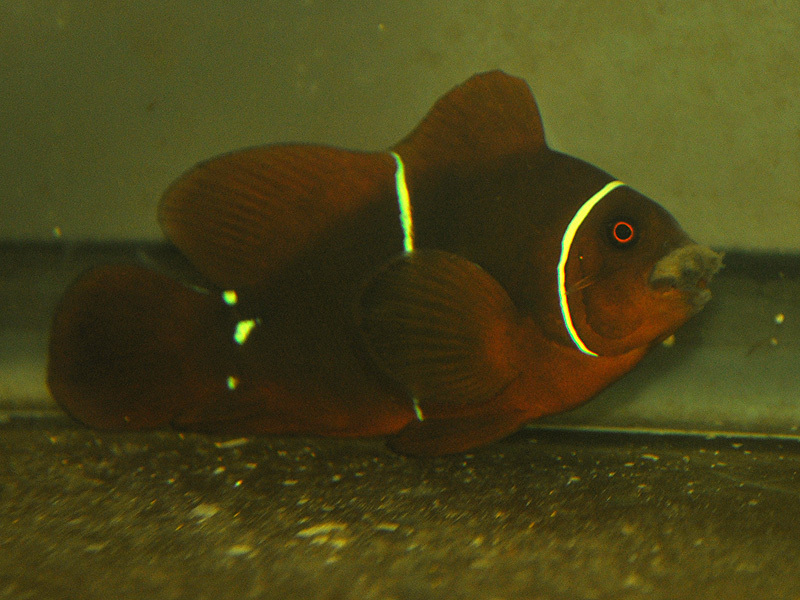 Both the female Maroon I first had so many problems with, and then the Morse-Code Maroon, basically shared similar afflictions (pop eye and mouth rot respectively) that I have encountered in none of my other marine fish. Yes, that’s it. NEVER. I cannot recall ever having popeye in another marine fish here, and certainly not mouth rot. So why would 3 out of 6 PNG Maroons be the only fish in my entire household to ever wind up with these diseases? Well, it’s much more understandable if we view this as a pathogen that they were all exposed to before they came to me. We know that Mycobacterium can lay dormant in fish for a long time, which could also explain why the Lightning Maroon has gone this long without issues. If it IS Mycobacterium behind the external and recurring symptoms I’m seeing, well, that could be *it* for the Lightning Maroon no matter what I do. It’s a very harsh theory to even consider, and even more alarming given that the theory happens to explain a whole heck of a lot of the issues I’d had, let alone also possibly explaining why these problems are isolated to a small group of fish from one species from one location, where half of them have had semi-common symptoms. For now, please just send all those positive vibes. The tank got a 10 gallon water change today, and hopefully the Lightning Maroon remains on the road to recovery. Let’s get several more good years with her if we can. I believe I shot these Sunday AM. It is now Monday AM, and honestly, things are improving. The appetite of the Lightning Maroon remains strong, which I’ve used to ensure that it continues to feed on the Dr. G’s antibacterial formula. I should preface this by saying that the Lightning Maroon has always been a timid feeder, so food generally has to flow right by its face / into its territory for it to feed. So I’m definitely not following the Dr. G. feeding protocol (as much as they can eat in one minute, every other day). In talking with the man behind Dr. G’s feeds, the feeds are set up to roughly deliver a “minimum effective dose”. In the case of the anti-parasite Dr. G. formulation (which is laced with Chloroquin Posphate), you can quadruple the feeding regime (twice per day vs. once every other day) and have no ill-effects on the fish (although the Dr. doesn’t recommend that). Knowing how most every antibiotic is normally delivered, it honestly doesn’t make sense to dose every-other day via feed, so I’m going to feed the food once per day to maintain antibiotic levels. It’s worth mentioning that the active ingredients in the Dr. G formula are Kanamycin and Metronidozole. All in all, this means that I have no less than 4 antibiotics running around. 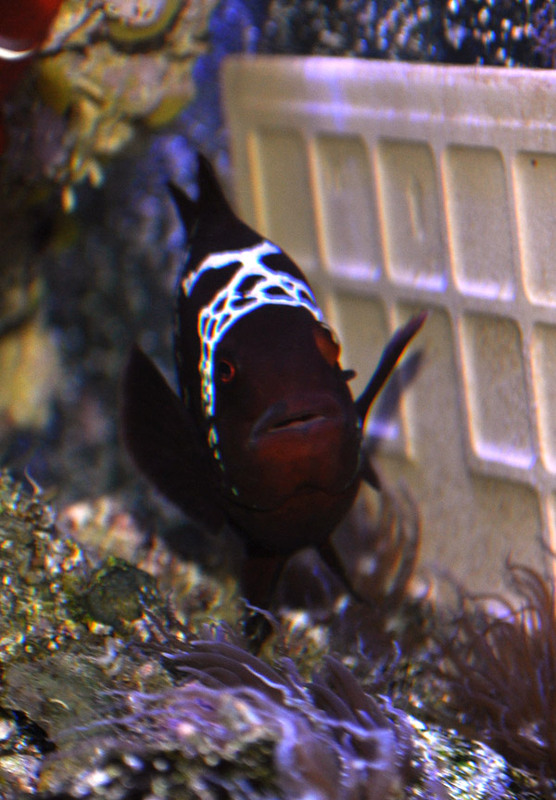 I’ve been talking with two fish vets who I’ll refrain from naming for the time being. One has of course, expressed concern over the “shotgun” approach, understandably so. For me, I’m thinking that the repeat of the Maracyn & Maracyn II are probably of little efficacy, but they were what I had on hand to immediately address the problem. Still, I am more likely to credit the Dr. G’s as the moment, if only because positive progress only started being made once it was introduced to the regime starting on Saturday evening. Still, it could be the other medications. The main goal here is twofold – #1. effectively cure this latest round of garbage. #2. figure out WHY it’s happening soas to prevent it. As of Monday AM, the eye looks better (less white stuff), so maybe we will get through this latest bout again. But I’m fully wondering what the heck is causing the fish to break down repeatedly. Mechanical damage? Food? Or could we even be looking at an old-age, immuno-compromized fish? Afterall, they DON’T live forever, they are NOT immortal. 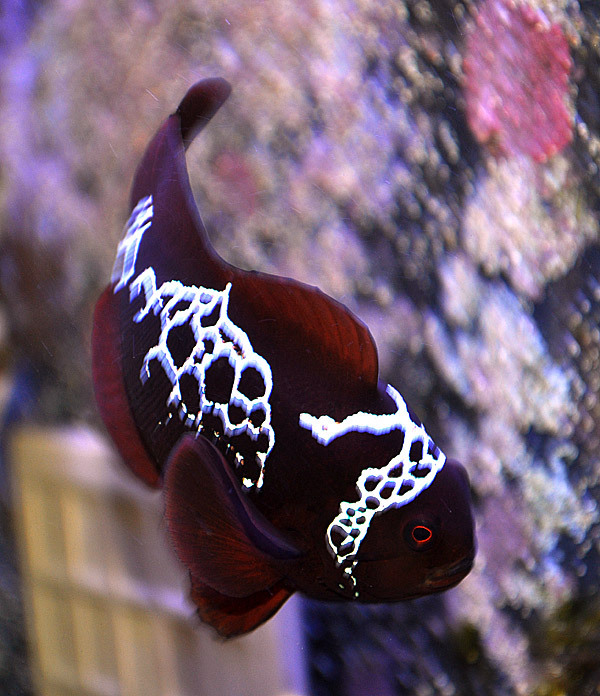 Could it simply be that the Lightning Maroon is an older fish, nearing it’s time, and all my drastic measures are simply staving off the inevitable? I hope not. Despite all this, the male is cleaning the tile like crazy. I promised photos, and I took them. I ended up not doing any subsequent antibiotic treatments, so I basically ran one day longer with the Maracyn SW than called for, and Maracyn II went the full course. I didn’t have a very cooperative photograph subject, but these photos of the Lightning Maroon were take on Thurdsay, May 3rd, 2012. You can see the difference in the right upper maxilary…certainly scarred at this point, but not the raging infection. And the appetite returned. 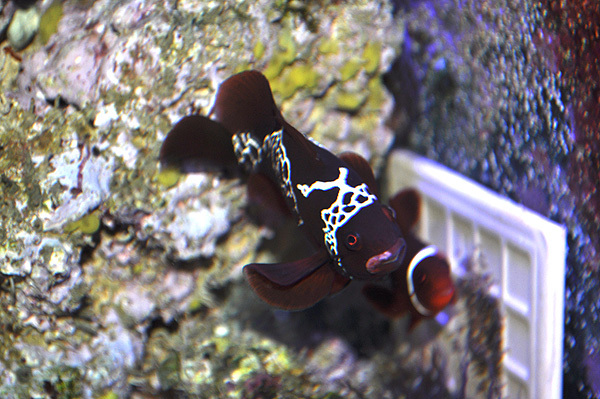 Plus, on Friday, the Lightning Maroon saw fit to go on a rampage of the sandbed, moving Goniopora and other corals around that had been left alone for months. By Monday, it seemed that nothing was progressing, and towards the evening, the slightly more “bold” Lightning Maroon personality had returned. I did a 5 gallon water change and once again dosed the tank with both Maracyn and Maracyn II, both the marine / saltwater formulations. It is interesting to note that I had a loss by this point – an Acropora frag that had been browned out for months, and had a little bit of cyanobacteria growing on it, well, that coral kicked the bucket during this treatment. IRONICALLY, it almost appears as if the Pink Birdsnest and Sour Apple Birdsnest are showing more intense coloration than ever…could be the water changes, could be something in the medication…hard to say at the moment. But I really want to hit home the efficacy of these two anti-bacterial products and their very apparent relative safety in reef tanks. Hobbyists are always scrambling for reef-safe medications, and in this case, I think you have very safe anti-bacterial agents to treat suspected bacterial infections in a reef tank. IF you must. Officially a crazy day in the Pederson household. By this point I was probably telling those who inquired privately that I was slowly gaining optimism that my course of treatment had been effective. Overall, I barely looked at the tank though other than to treat it. Another day of simply being very busy and stretched thin…our first summer-like day in Duluth had me spending most of my freetime in the afternoon trying to do some much needed outdoor work in the wind of opportunity that presented itself. Plus I’ve been busy with my work on the Banggai Rescue project. I did take a quick peak at the Lightning Maroon and dare I say it, it does appear that the infected areas of the maxillary are possibly even healing? It could quite well turn out that the fish may not lose the maxillary as I had feared, and quite possibly, it may not even be scarred when it’s all said and done? Before I knew it, 2:00 AM had already arrived and I had neglected to treat the Lightning Maroon. So I did a 5 gallon water change, and treated the tank. According to the manufacturer’s recommended treatment regimes, I’ve gone one extra day with the Maracyn and have completed the Maracyn II treatment course as well, albeit slightly late there at the by about 12 hours! The biggest question at the moment is whether I continue to treat with the antibiotics. Instructions on the packaging say to treat for 5 days even if symptoms disappear. But what if maybe they haven’t? Do I keep going? I may make some calls, ask around, or just by myself personal comfort time by going yet one more day. Afterall, there are diseases in humans that we have to treat with 30-day long antibiotic courses – I absolutely do not want to stop prematurely. I obviously owe you all pictures. That will be on my to-do list for tomorrow when I wake up. The long-term question is how do I prevent this from recurring. The concern is that while I perhaps got lucky and made the right decisions this first time around, if it comes back, it may be harder to treat (due to built up resistance). 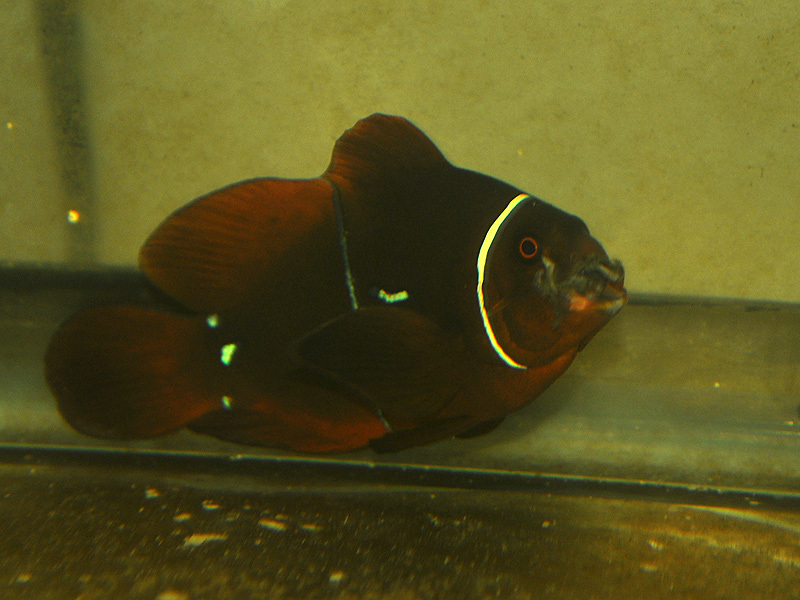 Obviously these fish already receive the most attention in the house most days, and are always the first to receive care and maintenance. And yet I still had a problem with a bacterial infection. Most of the time, we think of bacterial infections as being caused by poor water quality. But the reality there is that I maintain close to sps-level water parameters, have a good skimmer, etc. So what could be going on here? One of the things that had occurred to me is my use of very low-level vodka dosing. We know that carbon-dosing elevates bacterial populations and in doing so, helps “bind up” our nitrates in the actual bacterial mass. But could the carbon-dosing also cause elevated levels of pathogenic bacteria, and have indirectly caused this to happen? Obviously I’ve stopped vodka dosing during the entire treatment because I don’t have any effective skimmer at the moment (treatment with these antibiotics causes the skimmer to go truly haywire..I’m just letting it all spill back into the tank). My vodka dosing was at extremly low levels (1 drop per day) but still, maybe that was too much. Of course, the above is entirely conjecture, just a hypothesis at best. The other possible things to look at IS the introduction of the tile. I have legitimate concerns that the Lightning Maroon perhaps damaged its mouth when trying to evict the tile from its territory. If in fact the tile was indirectly related, I am hoping that its ongoing presence has simply become accepted, and thus, will no longer cause violent objections to its presence in their territory. And then there’s another thing we must consider. As with all wild caught fish, we have no clue how old they are. 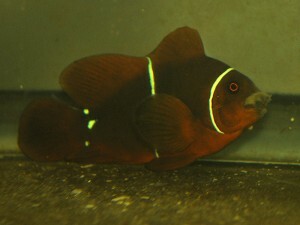 In the case of a Clownfish, I recall reading scientific documentation of a wild-caught Percula being 32 years of age. Most probably live far less, but still, if you live your life as a male, and your female lives a long time too, well, you stay small and live a long time. It is quite possible that our Lighting Maroon could be 5, 10, 20 years old already. There is, quite sadly, the possibility that the Lighting Maroon *could* already be old, and thus, could be slowly starting to slide downhill. Let’s hope it never comes to that, yet it is inevitable that sooner or later, the Lightning Maroon IS going to die. Realistically, odds are more likely that the Lightning Maroon was perhaps on the younger side of things, but then again, you don’t really know. When she does finally pass on, I’ve already committed to contributing her to scientific research. So that’s where things stand. Please keep sending the well-wishes, as I am not going to make George W. Bush’s mistake and declare “mission accomplished” just yet. On a scale of normal to WTF, we are at WTF. I’ll keep this short and bittersweet. In the last 24 hours the Lightning Maroon has developed a pretty rapid spreading case of what appears to be mouth rot. You may recall a similar situation occurring with the Morse-Code Maroon, and that did not end well. The biggest question is WTF – or more appropriately, WHY?! 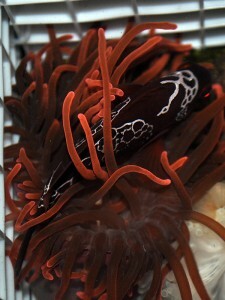 Did I introduce a pathogen from the Onyx Percula tank? It’s possible, but that group of fish has been disease free for who knows how long, and would qualify to be every bit as QT’d as the Lightning Maroon. PLUS, the Four Eye Butterflyfish that they reside with was taken from the Onyx Perc’s tank originally. So odds are that there was nothing new introduced. Does it have something to do with the eggs? Could be. Could be that eating fungused eggs exposed the fish to elevated bacterial / fungal levels which in turn has led to infection. Or it could be the tile surface is somehow abrading the lips as they clean, and again opening a pathway to infection. Or could it be something more sinister? If I’m blunt, perhaps the pop-eye I saw earlier on was not in fact a “bruise”, cauesed by mechanical damage, but was in fact an early warning sign for infection. If I really read some of the symptoms listed out, it actually sounds like a disease called Ichthyophonus hoferi, which is an internal fungal infection, with the exception being that the Lightning Maroon is not exhibiting any of the erratic behavioral symptoms. However, this disease does most closely match the symptoms of classic mouth-rot, which is treatable with Erythromycin (one of the rarer ones). In fact, you can pick up a package of Maracyn SW and pretty much it deals with all of these symptoms. I keep it on hand, and I’ve found it to be very reef-safe, so without hesitation, I removed the carbon and dosed the tank today with the first dose of Maracyn SW. As of this evening, I have seen no improvement, and in fact, it does appear that the Lightning Maroon lost it’s appetite tonight. This is NOT GOOD. I am toying with the notion of removing the egg tile. I’m looking at the Aiptasia in their vicinity and wondering if I need to eradicate those as well (haven’t caused any problems before, so why would they now…but maybe I still should). I am thinking of hitting both the Gram Positive AND Gram Negatives by including Maracyn II SW (Maracyn hits Gram Positive infections). I’m thinking about moving the fish into a well established QT tank. 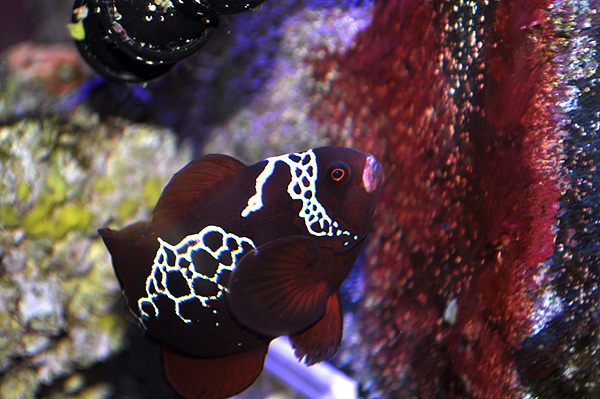 The options are endless, but it’s a situation like this where I hate being the fish vet, because the long-standing hobbyist in me has not seen a tremendous success rate in treating these types of infections. 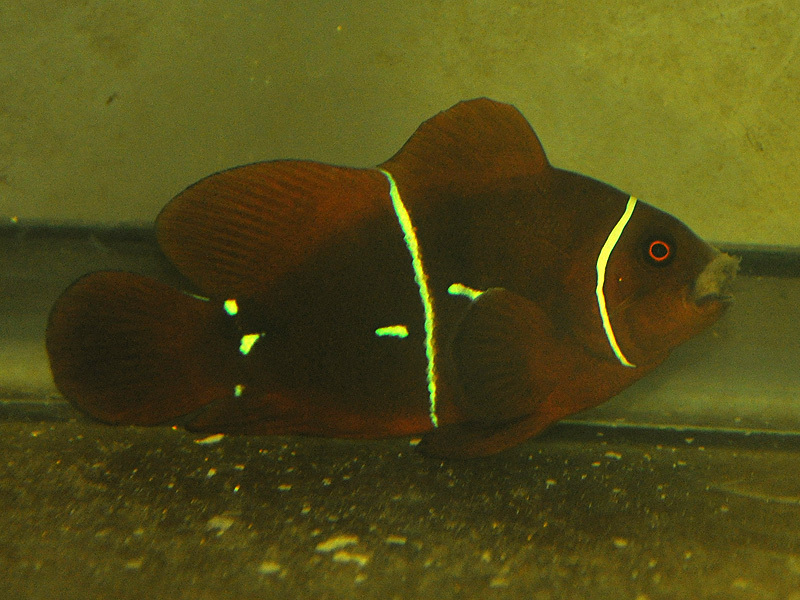 Of course, in the last 7 years, there has been only one other fish to have this issue…and that was another PNG Maroon. What are the odds? All fish will die, that’s a given fact. But damnit, I will be really bummed if this is how the story of the Lightning Maroon comes to pass. And yeah, I’m really going WTF…this is the type of disease that really just should never happen in a clean, well maintained system. WTF?! I half expected to wake up to a dead Lightning Maroon, but it wasn’t. It’s appetite was “not great”. So one of the big questions here is how to turn this around. I started medicating with Maracyn SW yesterday, but that only treats gram-positive bacterial infections. While the symptoms match up well with the symptoms of diseases Maracyn is supposed to treat, would it actually work? And so, I embarked on a search for the companion product, Maracyn II SW. The active ingredient is Monocycline. I was 30 minutes into a 6 hour round trip to the only store in the Twin Cities that had the medication on hand (Ocean Devotion), when I got a call back from local reefer Frank Wotruba saying he had it on-hand. Shortly therafter, Jay Hansen also called saying he had it on hand. 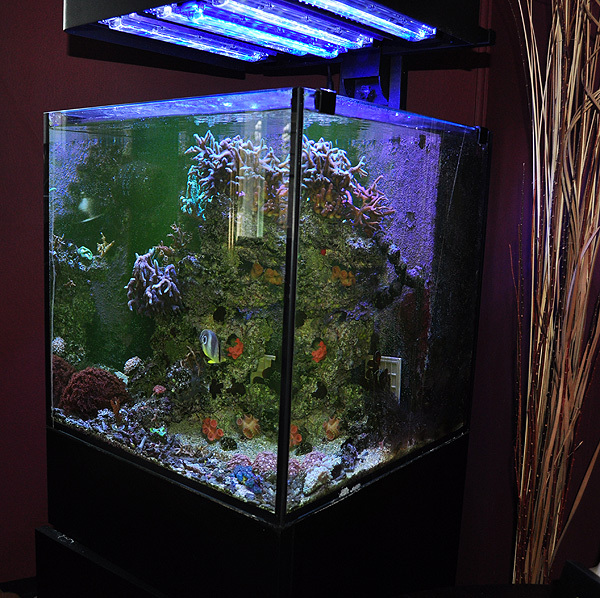 This is a great example of the benefits of being am actively participating member of a marine aquarium club. This means that the two can be conjoined, and so, without delay, I added in the first dosage of Maracyn II for marine fish to the Lightning Maroon’s tank. I think we’re looking at a pretty strong case to be made that both these anti-biotics are completely reef safe…although your water will glow yellow with the blue lighting. Once again I woke up expecting to find a dead Lightning Maroon. The spread of the mouth rot seems to have stopped, but there is definitely necrotic tissue breakdown happening. 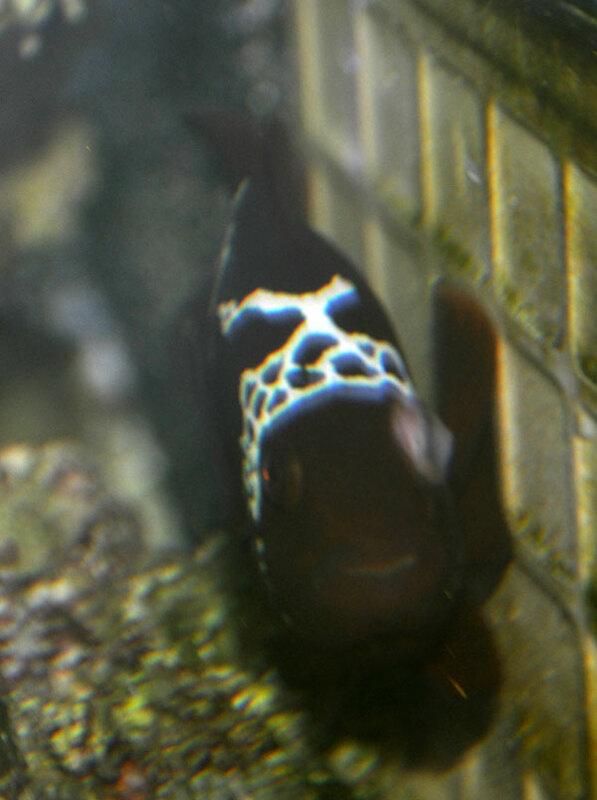 It is possible that even if I save the fish, it will loose at minimum the upper right maxillary. Thankfully that’s not a problem for a fish; they actually use maxillary clips in young salmonids to help with strain and year class identification in hatchery fish. Still, outwardly, things do not look any BETTER. Yes, I have contemplated surgery. Knowing that Maracyn II SW treats gram negative bacteria, and knowing that will more likely impact biological filtration, I did a 10 gallon water change around noon. 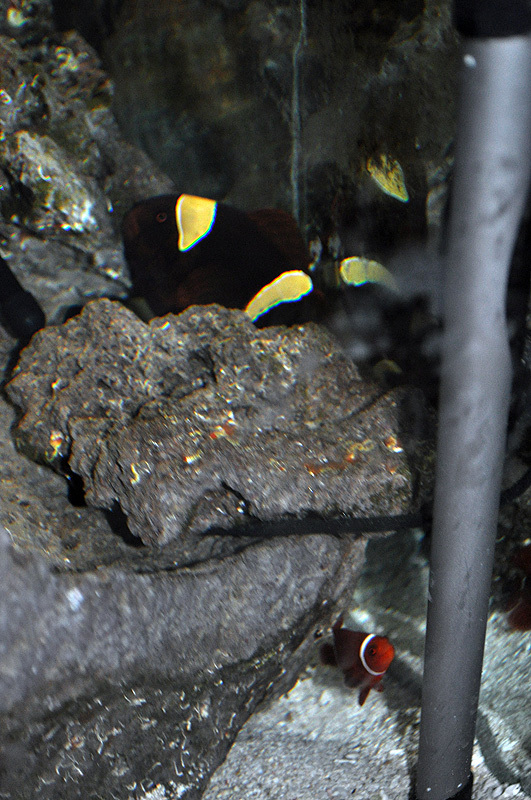 The Onyx Perc eggs hatched overnight, and the fish overall are ignoring the tile. 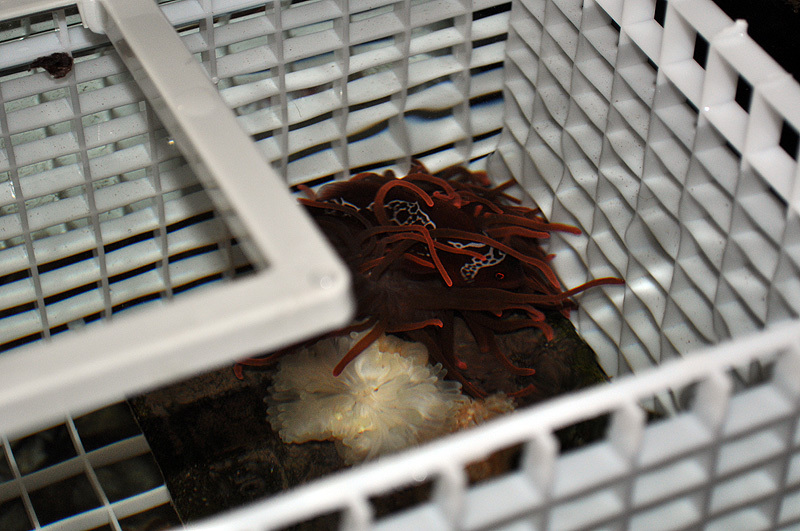 I did use some Tropic Marin ElimAptasia to knock back the larger anemones…while the fish might be protected, I wonder if the infected area is getting stung by the Aiptasia and screwing up the healing process. After this work, I dosed with both Maracyn SW and Maracyn II SW. So this is day 3 for Erythromycin, and day 2 for Monocycline. And yes, looking back at the Morse Code Maroon now, I know I switched to this combination of medications after Kanamycin failed to give me any results. If I am dealing with an internal fungal infection, particular the type that can be introduced through the feeding of raw fish (I have no clue what foods, if any that I have, contain raw fish), there is little I can do as far as my reading suggests. Still, I may have to switch here and go to a hospital tank if what I’m doing at this point fails to work. Yes, I am thinking of plan B now. I truly have no clue how this will all turn out, and I am beyond frustrated. That said, I’m also completely confident that I’m doing the best I can with the materials I have, so there’s no burden of guilt here. Solely the stress of fighting off what could be the end of a 2 year effort to breed this magnificent fish. Short update, I got on the Morse Code Maroon this morning and swabbed the area with Hydrogen Peroxide. I am guessing this fish will likely be dead in the next 24 hours. Ordinarily, a fish in this condition would be euthanized. Warning, the picture is pretty darn graphic. The fish’s entire upper maxillary has been rotted through, leaving two pieces hanging. I would be truly amazed if this fish were able to turn around,, but without finding an antibiotic regiment that is affective, this fish is going to be another loss. Sad to see this one going down this path, and really ticked that I found the problem early and addressed it early and it has still progressed unabated. N0te – the yellow tint in the water is from the Maracyn / Maracyn Two. A lot going on today! Today was just a crazy day. A week in the making, I owe a bit of thanks to Jonica and her husband Scott (rest of her name withheld for privacy). 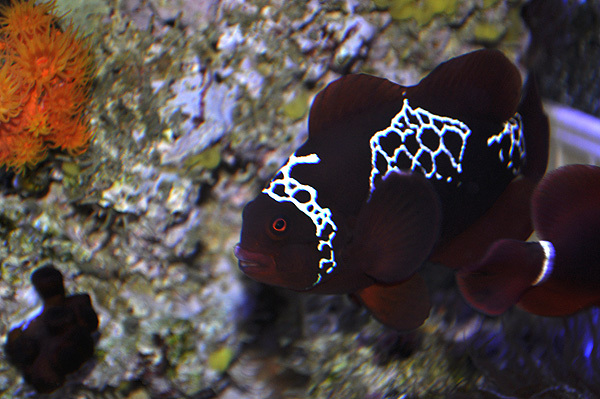 They provided the impetus for a day long road trip from Duluth to the Twin Cities region to pick up another massive female Maroon Clownfish. This one happens to be a Gold Stripe Maroon (Sumatran form). She’s pretty darn big, although the “Labrador” female from Frank & Mary has at least another 2 inches on her! Thanks for this great donation to the cause. She’ll have a good home here! As you may know, the *plan* for whatever big female I could find was to place her on the other side of the eggcrate with the “Morse Code” Maroon in the hopes of applying social pressure to test the sexuality of the Morse Code maroon, and hopefully keep it a male if it still could be a Male. Let me say now that the Morse Code Maroon continues to decline despite being hit with both Maracyn and Maracyn Two in combination. So I’ve now thrown three antibiotics at this problem with no resolution. It’s a slow progressing infection, but frankly, I hate to see fish suffer for so long. Here’s where things looked tonight when I got home. Now, I must say that I’m toying with swabbing that with Hydrogen Peroxide. At this point, what else can I really do?! Meanwhile, there is no way, and arguably no point, to introduce the new female Gold Stripe Maroon on the other side of the divider. The Morse Code is lethargic to the point where social pressure isn’t going to do a darn thing for it. There’s no positive upside at the moment to risking the GSM, so instead, she was placed into one of the QT Tanks with one of the smallest 3 PNG Maroons. Submission was instantaneous on the part of the little Maroon, so it is safe to say that at minimum, this one small PNG Maroon will remain male until called upon for service! IF by some crazy chance this pair happened to spawn, I may opt to rear the babies solely for practice, but all of them would be humanely euthanized. This may sound very cruel, but the reality is that such offspring are possible “hybrids” (there has been talk in the past that the Gold Stripe Maroon could be reclassified as a different species). Regardless, they would be a mixing of color variants / races, which for all intents and purposes is something fish breeders should strive to avoid. Afterall, I could hypothesize that the resultant offspring could turn out like either parent, or more likely a muddled version of a GSM. And the reality is they wouldn’t be discernible by the average hobbyist or even most breeders. In other words, there is NO upside to releasing such a fish into the hobby. So yes, they would be put down. But at least I would get some valuable experience rearing Premnas larvae. 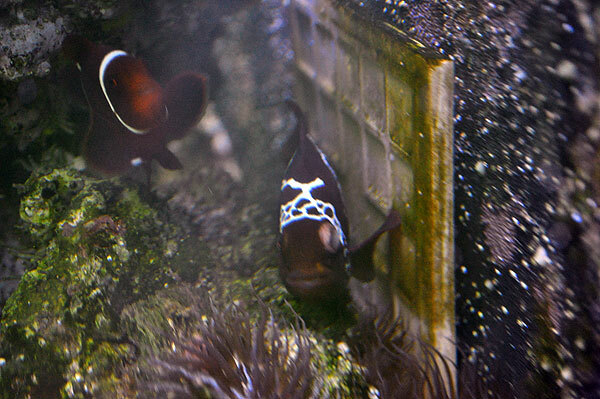 Long term though, this temporary pairing will be split up, and each fish ultimately placed with an appropriate mate. 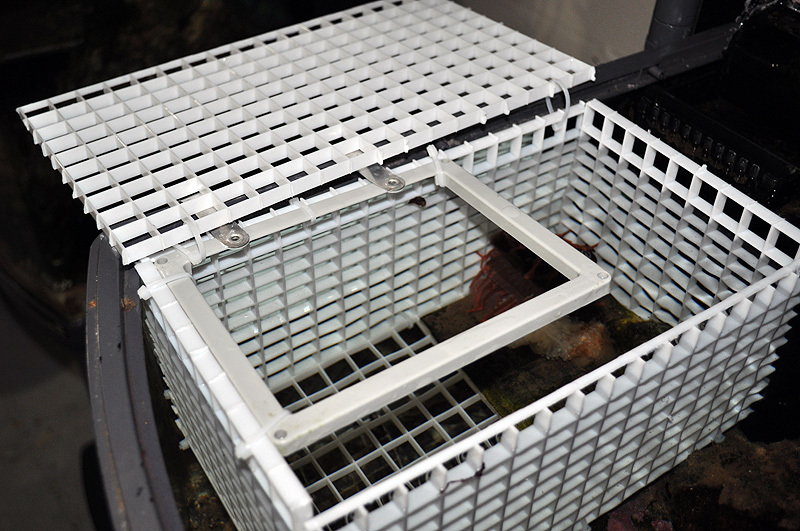 Meanwhile, I finally found the time to do a bit of eggcrate and zip tie fabrication. The Lightning Maroon has been given a larger, more spacious home with a better view and the ability to better interact with the Labrador Maroon. If they couldn’t see each other before, now they can. The new eggcrate cage is pretty substantial. 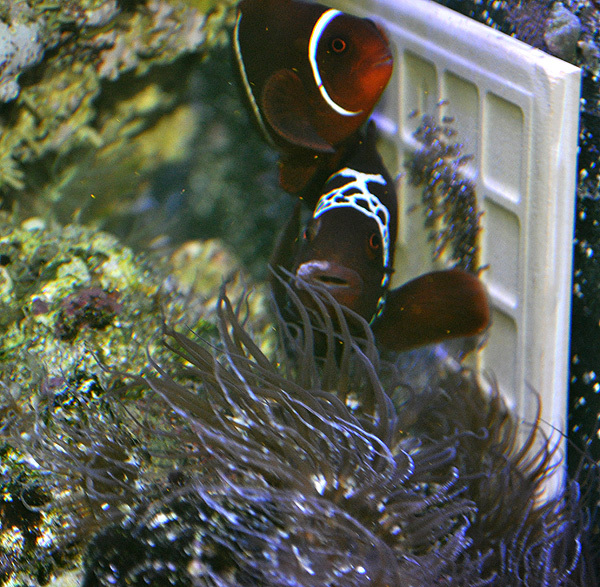 I’ve heard stories, I think one told to me by Carl Kmiec, of clownfish being able to fertilize a spawn even when separated by eggcrate, even several inches away. Could that happen in this situation? Who knows?! 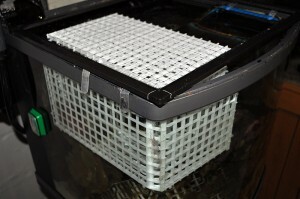 New larger "egg crate" breeder net! Hinged top opens to provide easy access. Used the frame from an old breeder net to provide easy hangers. The Lightning Maroon Clownfish chilling in his deflated bubble tip anemones. One more top down view of the Lightning Maroon chlling in its RBTA! That’s going to be it for tonight! Catch you tomorrow!